2. The second method is to install what’s called a “mobile plugin.” On a WordPress website, a mobile “plugin” is a software addition that takes existing content and makes it readable. 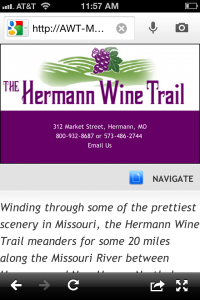 (Midwest Wine Press is a WordPress website.) With this method, website content might also need to be tweaked to make it mobile friendly. If you are committed to on having a custom designed website with lots of bells and whistles, then this option might not be for you. But using WordPress and plug ins is less expensive while accomplishing the goal of creating a site visitors can read on a cell phone. Here is an example of a mobile plugin that was added to a WordPress website. 3. 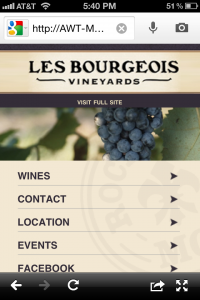 Another way to create a mobile friendly website is to add a Mobile Template. I tried this method and was surprised how easy it is. First, go to HowToGoMo.com, a Google service that shows how an existing website looks on a smart phone. This tool provides a report on how well a website functions on a mobile phone and how to make a website more mobile friendly. Next, you can build a new site in minutes with the site-builder tool from Dudamobile, an internet based app developer. It really works. I built my new website in minutes and added a ‘Call Me” button so clients can call me from my website. Just think how happy your customers will be if they can call to see if your business is open. Below is a before and after photo of my website taken from a smart phone. And, even better, all this is free! 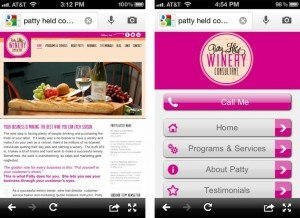 For more information on mobile friendly websites please visit www.pattyheldconsulting.com.